On October 25, 2016, in response to reports of racial tension and discrimination within Philadelphia’s LGBTQ population, the Philadelphia Commission on Human Relations held a public hearing, pursuant to its powers under the Home Rule Charter, the Fair Practices Ordinance, and the governing regulations. Consistent with its mission, the Commission sought to hear firsthand experiences with racism and discrimination committed by establishments and institutions that anchor the geographical community known as the Gayborhood. Over 375 people attended the hearing, which was held at Liberty Resources, Inc. in Philadelphia. Among the attendees were the owners of 11 bars in the Gayborhood, who were subpoenaed to appear by the PCHR, and directors of the non-profit organizations who provide services for the LGBTQ population. There were 29 speakers at the hearing and approximately 20 others submitted written testimony or provided information by phone. As a result of both subpoenas and voluntary submission, the Commission obtained dress code, employment policies, nondiscrimination policies, training manuals, and other data related to policies governing the provision of services to patrons and clients. Overwhelmingly, the testimony revealed incidents of bias, feelings of frustration, prejudice, and discrimination in places of public accommodation in the Gayborhood and in places of employment at the Mazzoni Center and Philadelphia FIGHT. In this Report, we summarize the state of public concern, setting forth our findings related to racism and discrimination around the Gayborhood, in bars/nightclubs and within non-profit social service providers. Recommendations are based on our findings and reference work LGBTQ people of color and their allies have done to address and dismantle racism and discrimination in the LGBTQ community. PCHR is committed to developing tools, strategies, and resources to directly address these issues and to hold institutions accountable. We will work together to keep the public informed, provide training on the city’s anti-discrimination laws, monitor the implementation of our recommendations and enforce the laws under the Fair Practices Ordinance. 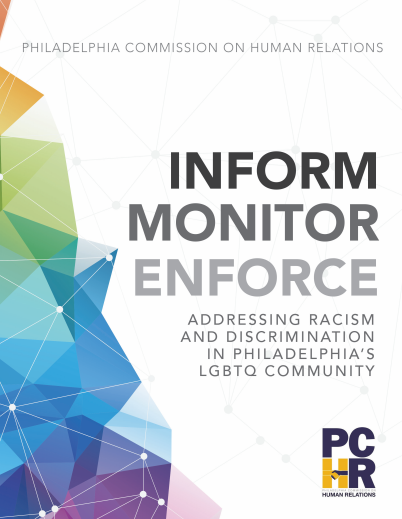 The PCHR will support non-profits and places of public accommodation that serve Philadelphia’s LGBTQ community in making the changes necessary to alleviate racial bias and discrimination. A transcript of the proceedings is available on the Commission’s website.